This tanpatsu celebrates the tenth year of this popular Japanese anime, originally a manga created by Aoyama Gosho. The story takes place when Shinichi was still a high school student. 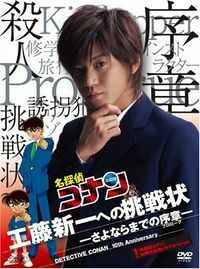 The talented young detective Kudo Shinichi receives a message: 'I will kidnap one of your classmates during your class trip.' Shinichi is going to find out the truth.